At least 15 Palestinians were kidnapped by the Israeli occupation forces (IOF) from the West Bank at daybreak on Thursday. Four Palestinian young men were kidnapped by the IOF from Nablus province. Another youth sustained leg injuries in clashes that burst out shortly after the occupation troops rolled into the area. A number of Palestinian protesters choked on teargas moments after the occupation troops stormed Qalqilya province. The IOF further wreaked havoc on civilian homes and subjected the residents to intensive questioning. Meanwhile, Israeli military troops stormed Zabouba town, west of Jenin, and set up a military checkpoint, where Palestinian civilians were subjected to harsh crackdowns. The Israeli army claimed, in a statement, responsibility for the abduction of 15 Palestinians at the crack of dawn. At the same time, the occupation soldiers stormed the office of al-Hurriya radio station in al-Khalil and ruled that it be closed for six months. The Israeli troops seized broadcasters, cameras, laptops, and audio devices. They further blew up the gates of two closed rooms in the office. Director of al-Hurriya radio station said the seized equipment is worth over $400,000. The Palestinian Prisoners Society (PPS) has reported that Israeli soldiers abducted, at dawn Thursday, ten Palestinians, from their homes in several parts of the occupied West Bank. It stated that the soldiers abducted a young man, identified as Zohdi Abu Shousha, after invading his home in the al-Am’ari refugee camp in the Ramallah and al-Biereh Governorate. The soldiers also invaded the home of detainee Nazzal Barghouthi, 28, in Kafr Ein village, northwest of Ramallah, searched the property and confiscated recording equipment. 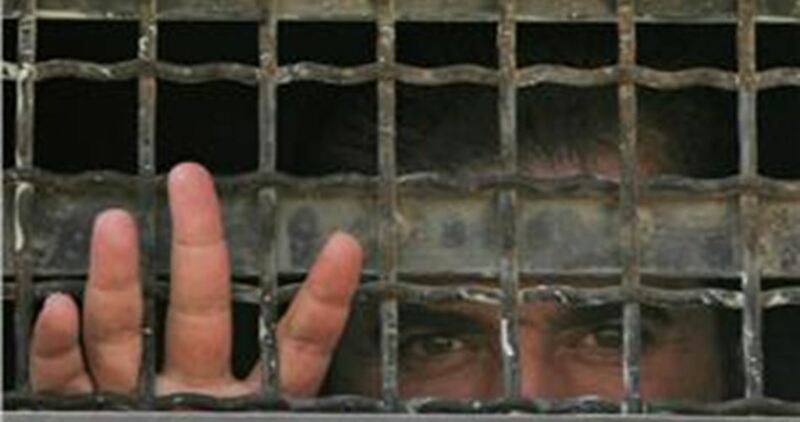 Barghouthi was taken prisoner two days ago. Clashes took place between the soldiers, who fired gas bombs and concussion grenades, and many local youngsters, who hurled stones at the invading military vehicles. 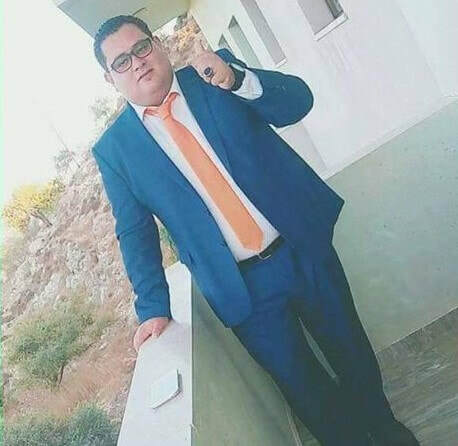 In Nablus, in northern West Bank, the soldiers abducted Osama Sawalma, a medicine graduate at the Najah University, from ‘Aseera ash-Shemaliyya town, northwest of Nablus. Israeli soldiers invaded, on Thursday at dawn, the village of Marka, south of the northern West Bank city of Jenin, and abducted three siblings from their home. 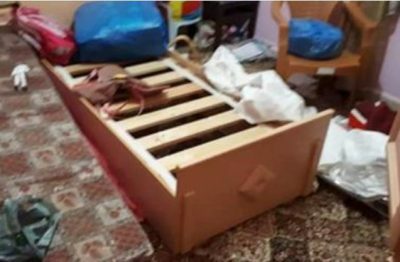 The Jenin office of the Palestinian Prisoners’ Society (PPS) said the soldiers abducted ‘Ala, Hamza and Yousef Hasan Abu Jalboush, after invading their home and ransacking it, causing excessive damage. On Thursday at dawn, Israeli soldiers invaded Ya’bad town, west of the northern West Bank city of Jenin, and abducted a young Palestinian man. 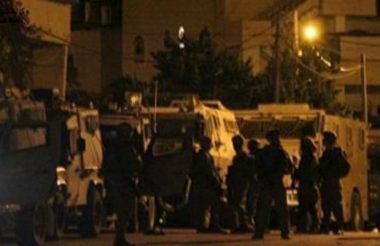 The soldiers also briefly detained, on Wednesday night, several Palestinians near Jenin. Several army jeeps invaded Ya’bad town, before deploying and surrounding many neighborhoods, and abducted a young man. Media sources in Jenin said the soldiers broke into and searched several homes, and abducted a young man from al-‘Tatar family. 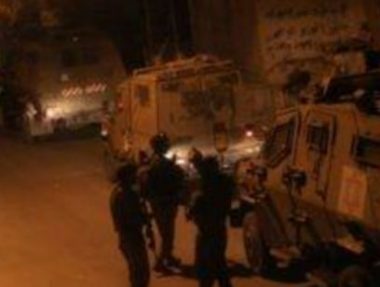 On Wednesday at night, the soldiers detained and interrogated many Palestinians at a sudden roadblock between Rommana and Zabbouba villages, west of Jenin. Eyewitnesses said the soldiers examined the ID cards of the detained Palestinians, and demanded many of them to provide their phone numbers. The Israeli occupation forces (IOF) last night arrested a group of musicians in Beit Rima town, north of Ramallah in the West Bank. Local sources told the Palestinian Information Center (PIC) that Israeli soldiers aboard patrol vehicles stormed Beit Rima and rounded up vocalist Mohamed al-Barghouthi, keyboardist Naji al-Rimawi and studio owner and producer Nazzal al-Barghouthi. The family of vocalist Barghouthi said that soldiers broke into and ransacked their house in the town and confiscated memory cards containing concert songs. The family added that Barghouthi’s father, who suffers from a heart problem, was also transferred to hospital after soldiers harshly treated him during the raid. The three Palestinians were arrested over a song sang recently by Barghouthi. The song, which others participated in, praised prisoner Omar al-Abed, who carried out last July a stabbing attack in the illegal West Bank settlement of Halamish in response to Israel’s escalation of its violations in Jerusalem and at the Aqsa Mosque. 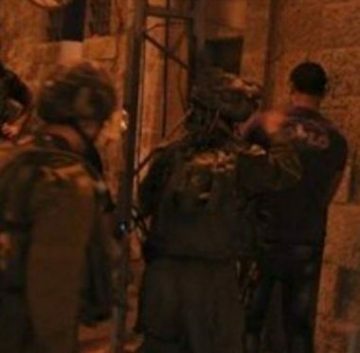 The Israeli occupation forces (IOF) at dawn Wednesday kidnapped 16 Palestinian citizens, including a woman, from their homes in different West Bank areas. A reporter for the Palestinian Information Center (PIC) said that the IOF kidnapped the citizens from the provinces of al-Khalil, Bethlehem, Jerusalem and Ramallah, adding that an active female member of the student Islamic Bloc at Hebron University was among the detainees. The reporter explained that Israeli soldiers stormed Dura town in al-Khalil and kidnapped Sojoud al-Darawish, a female student at Hebron University and a member of its Islamic Bloc (the student wing of Hamas). The IOF also kidnapped a young man called Mu’men Abu Hawwash from his home in at-Tabaqa town near Dura and clashed with local young men. Another young man identified as Osamah al-Ammour was taken prisoner during IOF raids on homes in Yatta town. 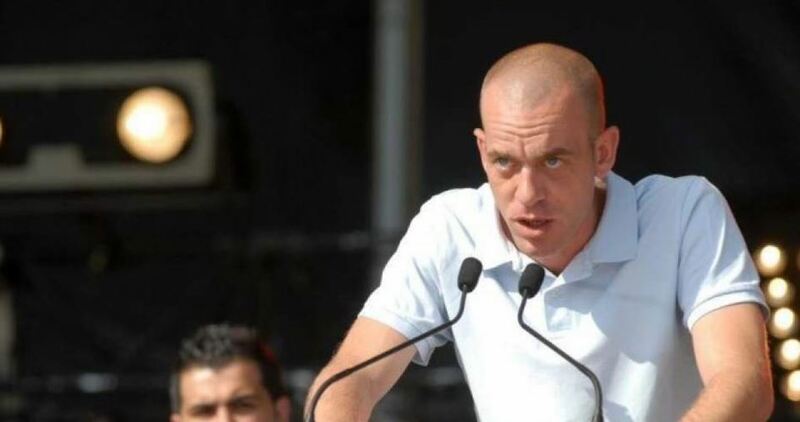 The IOF also handed an ex-detainee called Zuhar Makhamera a summons from the Shin Bet ordering him to go its headquarters in Kfar Etzion settlement for interrogation. In Bethlehem, five young men were rounded up by soldiers during IOF campaigns in the towns of Husan and Fajjar. Three of the detainees are from the family of Taqateqa and two others were identified as Abdullah-Shusha and Ghassan Hamamera. In Ramallah, the IOF detained Mohamed al-Barghouthi, a popular singer, after raiding his home in Beit Rima town on a charge of praising a prisoner in one of his concerts. Another citizen was also kidnapped from his home in the town. Two others were taken prisoners in IOF campaigns in Kafr Ein town (Ramallah) and Abu Dis town (east Jerusalem). For its part, the Israeli army claimed its forces arrested two Palestinians in the Tulkarem towns of Kafr Abbush and Ramin and one in Azzun town, east of Qalqilya. 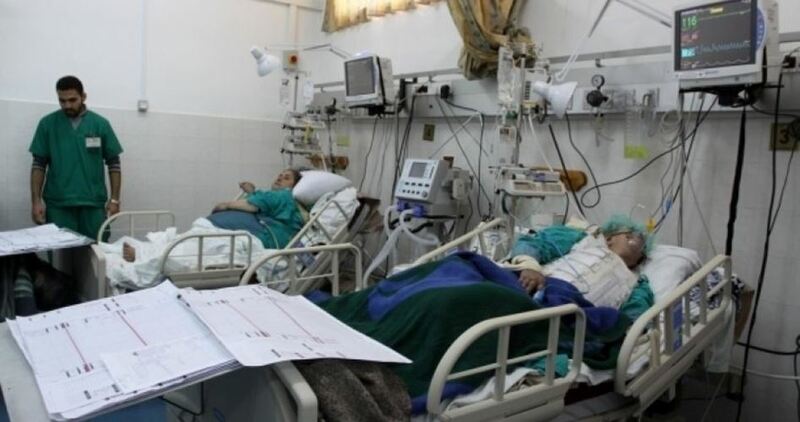 The Center said that Kaenat Ja'rour, 42, a uterine cancer patient, and Faten Ahmad, 26, who suffered a brain tumor, died after the IOA rejected their requests and appeals to obtain permits many times. The Israeli occupation forces on Tuesday kidnapped a Palestinian woman from al-Aqsa Mosque—the third holiest site in Islam. 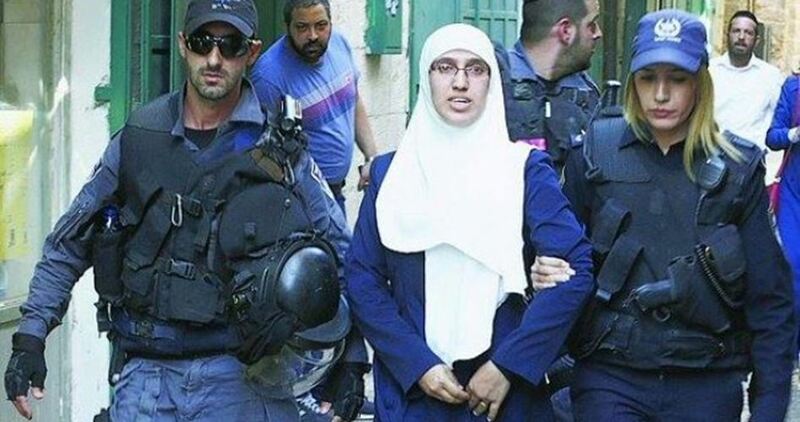 Palestinian woman Raeda Sa’id was kidnapped by the Israeli forces from al-Aqsa’s gate of al-Asbat at noontime and dragged to an Israeli interrogation center in the Old City of Occupied Jerusalem. At the same time, activist Amjad Abu Assab said the Israeli Magistrate’s Court decided to acquit the female Palestinian instructor Manal Shweiki, 34, on conditions of a two-week house arrest and a fine of 10,000 shekels. Expectant al-Shweiki is the mother of four children. She was kidnapped by the occupation forces from her home in Silwan town, south of al-Aqsa Mosque, on Wednesday. In another development, 12 Palestinian instructors were recently dismissed by the Israeli Ministry of Education on allegations of anti-occupation incitement at school. Israeli authorities issued on Tuesday a six-month administrative detention order against the Jerusalemite prisoner Salah Hamouri. According to PIC reporter, Hamouri was supposed to be released on Tuesday based on a decision by the Jerusalem Magistrates Court, but Israel's war minister, Avigdor Lieberman, issued an order to hold him in administrative detention. Hamouri was arrested from his house in Kafr 'Aqab neighborhood in Occupied Jerusalem on 23rd August before being immediately transferred to al-Maskoubiya interrogation center. He had previously spent six years and a half in Israeli jails after an Israeli court accused him of being a member of the Popular Front for the Liberation of Palestine and planning to assassinate rabbi Ovadia Yosef. A father of one child, Hamouri has received many orders from the Israeli authorities preventing him from entering the West Bank. The soldiers also abducted a young man, identified as Mousa Suleiman Sa’ada, and took him to an unknown destination. 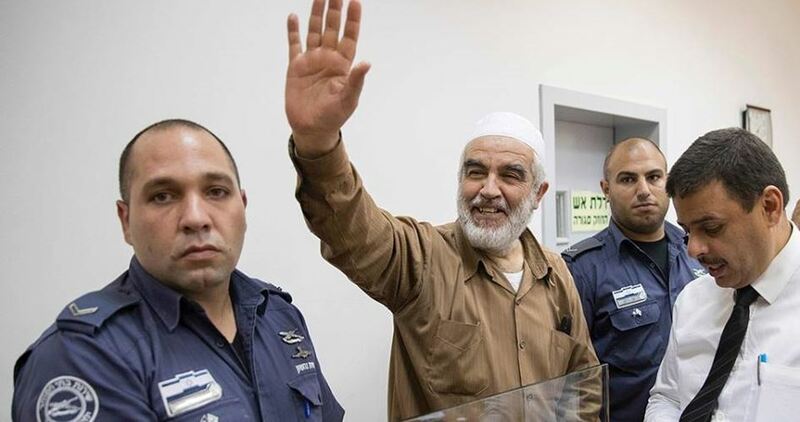 The Israeli Magistrate Court in the northern city of Haifa extended the detention of Sheikh Raed Salah, the head of the Islamic Movement in 1948 Occupied Palestine, until September 06, Salah’s lawyer Khaled Zabarqa said. Sheikh Salah has been held in a bathroom-lie cell where he is forced to live, sleep and even pray inside. Two cameras were set up in order to monitor him, Zabarqa told the PIC. Describing the issue as politicized, Zabarqa asserted that the indictment brought against Salah violated his fundamental rights as a religious leader and prominent political figure. Israeli police arrested Sheikh Salah on August 15 from his home in the northern city of Umm al-Fahm, accusing him of “membership in an illegal group” and “inciting violence”. The Israeli Lod District Court extended the detention of a 19-year-old Palestinian prisoner, Ismail Abu Aram from Yatta town in al-Khalil, for the fifth consecutive time, lawyer Khaled Mahajna said. In a statement on Monday, the Lawyer of Detainees and Ex-detainees Committee added that the Israeli attorney general brought a 19-article indictment against captive Abu Aram. Israeli authorities had issued an order that banned publishing any news on the case before Monday, the lawyer pointed out, adding that the next court session will be held on September 14. Detainee Abu Aram is charged with carrying out an anti-occupation stabbing attack on August 02 in Yavne city in 1948 Occupied Palestine. 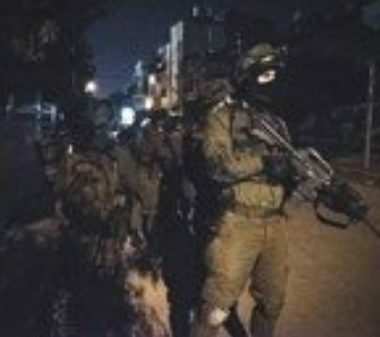 Israeli soldiers invaded, on Monday at dawn, many homes in several parts of the occupied West Bank, including East Jerusalem, searched the properties and abducted ten Palestinians, including one child. 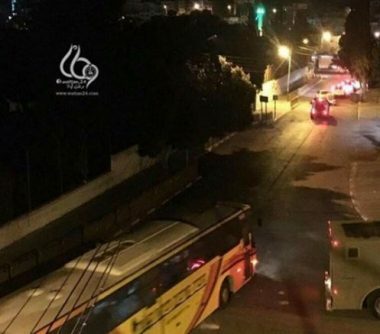 In Jerusalem, the soldiers invaded homes in Ein al-Louza neighborhood, in Silwan town, and searched them before abducting two Palestinians, identified as Emadeddin Khalil al-‘Abbassi, 30, and Mohammad Yousef Abu Tayeh, 21. The soldiers took the two Palestinians to detention and interrogation centers in Jerusalem, and later released Abu Tayeh. The Bethlehem office of the Palestinian Prisoners’ Society (PPS) has reported that many soldiers invaded ‘Adia refugee camp, north of Bethlehem city, searched and ransacked homes, and abducted Adam Mohammad Darweesh, 15, and Ma’moun Bdeir, 22. Furthermore, the soldiers invaded a school in Batteer town, west of Bethlehem, smashed many doors before searching several rooms and confiscated surveillance equipment and tapes. Also, several army vehicles also invaded ‘Arraba town, south of the northern West Bank city of Jenin, searched homes, abducted Abdul-Jabbar Jihad Abu Salah, 19, and confiscated a computer belonging to his brother. It is worth mentioning that the Israeli army said the Palestinian, who was taken prisoner in ‘Arraba, is a member of Hamas movement, and added that the soldiers also arrested another Palestinian in Be’er al-Basha village, south of Jenin. The soldiers also abducted one Palestinian, identified as Wisam Waleed Ghawadra, in Deir Abu Mashal village, in addition to Mohammad Majed Khalaf and Ali Ahmad Makhlouf, from the al-Jalazoun refugee camp, and Nimir Ali Hamed, from Silwad town, in Ramallah governorate. 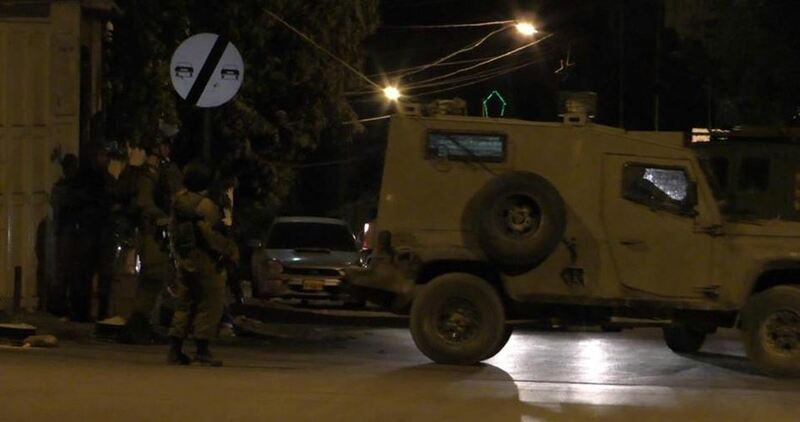 Furthermore, the soldiers abducted one Palestinian in Surif town, west of the southern West Bank city of Hebron.